The weather in my area has been unseasonably warm. It was almost 70 degrees on Tuesday and it has been making my kids a little bit wild. With the warm days it feels more like spring than almost Christmas. Even though the weather has been all over the place, I refuse to let it change my food plans. This is the time of the year when I make pumpkin cookies, eggnog baked good and most importantly stews. I love stews. They are delicious and comforting. I make them at least twice a month and they are a fall stable in my house. Since I now am eating gluten free I have had to find new stew recipes that work well with gluten free flours. This week I tried a new recipe for Slow-Cooker Caribbean Beef Stew from the December issue of the Food Network Magazine, which looked full of classic Caribbean flavor from the allspice and white pepper and perfect for a busy weeknight. This reicpe 13 ingredients. It takes a total time of 7 hours and 15 minutes, 15 minutes of which is active and makes 4 servings. I had no problems finding any of the ingredients at my local grocery store. Since I don't use wheat flour I substituted the all-purpose flour for gluten free all-purpose flour. Crock-pots can be very hard to clean so I always use slow-cooker liners to reduce the mess. I let my stew cook on high for 7 hours. When I only put my potatoes in the crock-pot on low for 7 hours they never seem soft enough to me, so I normally cook my stews on high. Finally, I decided to top the servings with scallions for taste and presentation. I followed the remainder of the recipe as written. Make sure to adequately salt this stew once it is done in the crock-pot. The recipe requires more salt than the recipe states. My husband and I really liked this stew. The flavor was great and the spiciness from the green chiles was delicious. My two boys thought it was a little too spicy for their tastes, but I added sour cream to their servings and then they ate it happily. For the recipe go to Slow-Cooker Caribbean Beef Stew. 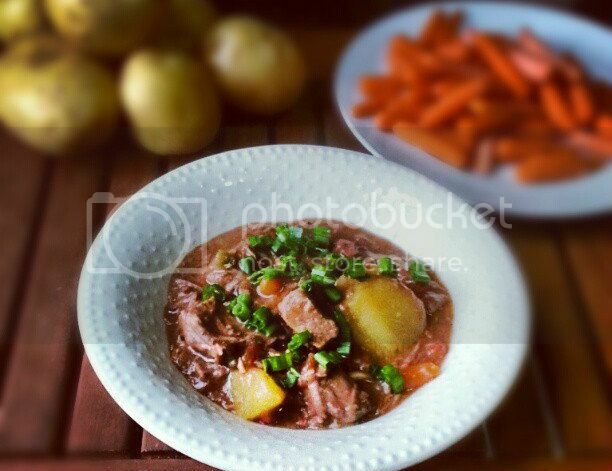 I need to get a crock pot to try making some of these stews over the winter. They really are a great investment, especially in the winter for stews!